This PEMF mat is multi-dimensional. You can see on the brochure the benefits of each therapy. Use the PEMF energy first, outside the chamber for 8 minutes. Many military vets on Facebook have been doing this combination with great results. 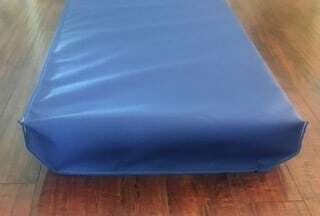 What Makes these Multi-Therapy PEMF Therapy Mats SO UNIQUE? All natural amethyst is used and different colors don’t affect healing properties. Amethyst is known to give a calming effect. Tourmaline has the highest level of negative ions, with slightly lower levels of far infrared. Natural tourmaline is physically similar to charcoal so it cannot be used in its natural state. We crush tourmaline and mix it with ceramic to make tourmaline ceramic. This way it is sturdy and the process also increases the negative ion output. Tourmaline is known to have an energizing effect. Jade is somewhere between the soothing amethyst and the energizing tourmaline. Natural jade is polished and an ideal size is used on the pads. This pad has the ideal combination of three stones so you get to enjoy the benefits of all. HealthyLine pads incorporate a few different systems that reach the common goal of improved health. 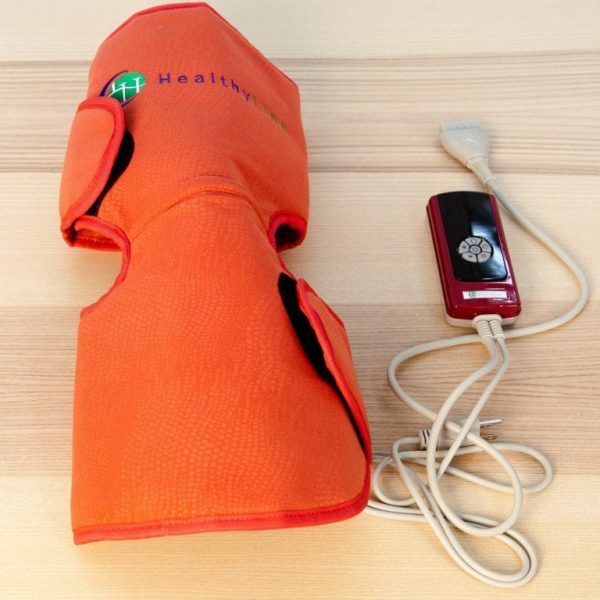 Each HealthyLine pad provides negative ions, far infrared rays, and heated gemstones. The gemstones naturally emit negative ions and far infrared, and when heated the stones become activated and provide benefits at a greater level. This is made possible with many functional layers. Essentially, a wire that heats up goes through the pad. That wire is lined with silicon coating that filters bad EMFs from the mat. Additional layers help with heat distribution so the mat heats up evenly all throughout. The outer layers are made with high quality synthetic leather. Human body temperature is approximately 38 degrees Celsius so that would be an ideal point to start. Gradually increase the temperature to test your tolerance. Set your temperature lower for longer usage and higher for shorter periods. Always drink lots of water before, during, and after use to prevent physical effects of dehydration. 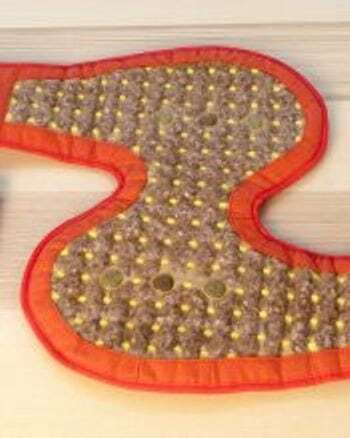 THIS MAT CAN BE OPENED AND USED ON BACK, STOMACH OR OTHER BODY PARTS! Our knee wrap from our InfraMat™ line is designed to envelop your knee in heat. The jade stones lining the wrap emit negative ions through Far-Infrared (FIR) that reduce pain, help in healing injuries, and promote a higher cellular metabolic rate. Negative ions are important to our health, as they reduce the presence of positive ions (free radicals) and restore balance to the human body. Negative ions are noted for strengthening the functions of autonomic nerves, reinforcing collagen production, improving the immune system, and increasing metabolic rates on the cellular level. 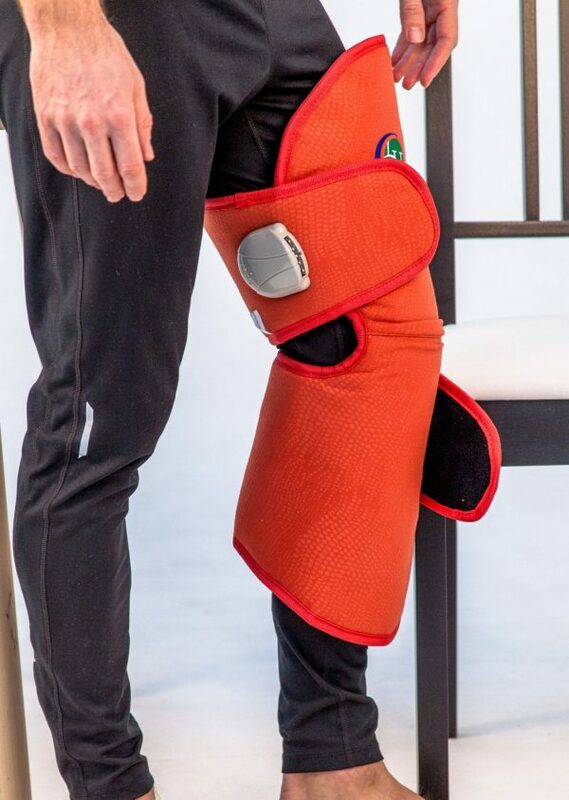 With your knee wrap, the jade combined with the negative ions will provide more oxygen to your cells and tissue, bringing you a flood of warmth and relaxation after a rough day. The knee wrap will also speed up the oxidation of serotonin in your blood stream, which will brighten your mood and relieve your pain. 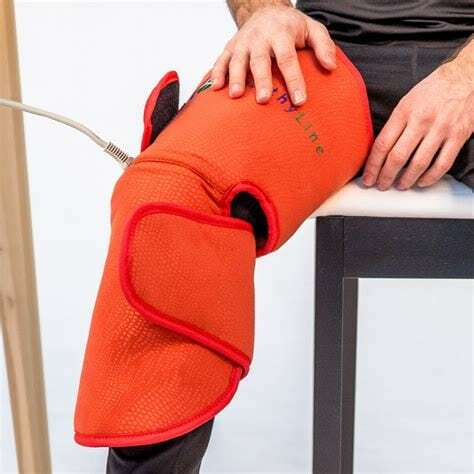 We suggest using your knee wrap on a medium heat for best results, but if you prefer a high heat setting, you should place a towel between your knee and the wrap. The knee wrap comes in a pair attached by a wire so that you can provide relief to one or both knees. The heat produced by the jade is emitted on the Far Infrared spectrum, which allows heat to penetrate deeper under your skin–straight to the muscles and tendons. 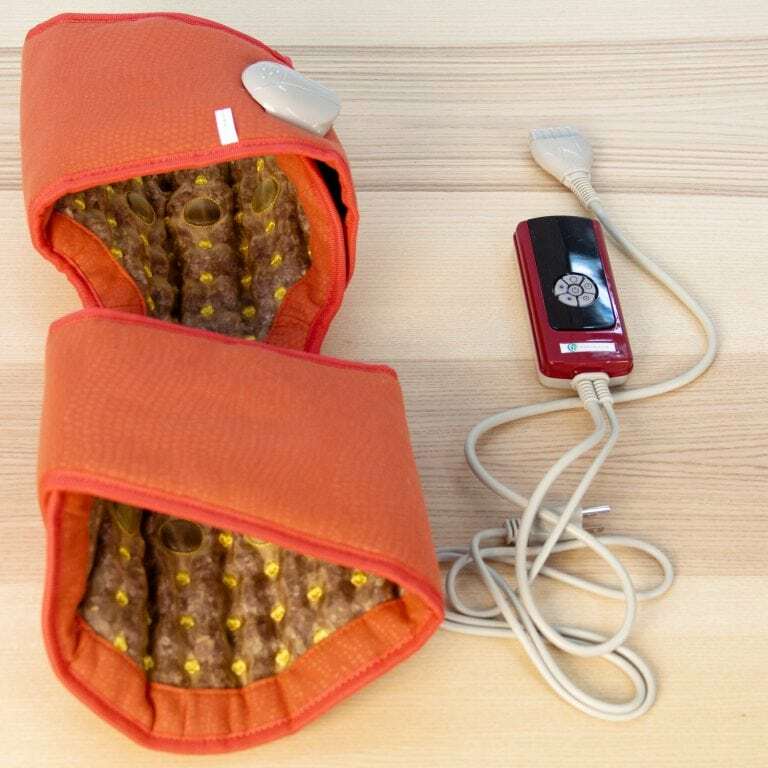 This form of heat therapy will expel toxins and heavy metals that pollute our bodies every day, meaning better health for your body overall and a concentrated source of heat for your knees. All these benefits are designed to increase your overall well-being to bring you a sense of balance when you use your knee wrap. Day-to-day use is recommended to ensure your body is getting the rejuvenation it needs to keep up with your busy and stressful lifestyle. HealthyLine™ is a USA company providing the healing power of jade through their InfraMat™ technology. It’s a knee wrap for direct use for knee therapy. A rare and unique model. Recommended to use medium heat. If used with maximum heat, use a towel between the stones and the knee to avoid direct contact with the hot stones. 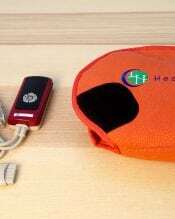 Sold as a set of two wrap pads, connected with a wire. REAL GEM STONES. The use of hot stone therapy is not a new concept. Hot stones have been used for centuries to help relax tight muscles, reduce stress, and increase circulation. In most cases, these stones are used individually by reflexologists and massage therapists and these sessions can end up costing you a lot of money. The Inframat Pro combines hot stone therapy with several other technologies in one product that provides a myriad of health benefits and promotes an overall feeling of well-being. Far Infrared (FIR) therapy penetrates 4-6 inches through the body’s tissues to stimulate the circulatory system. The benefits include increased oxygen movement, decreased pain, inflammation, and stiffness, and decreased stress levels. FIR therapy promotes relaxation as well as giving off a sauna-like effect which can actually burn up to 900 calories during use. Negative ion therapy increases collagen production within the body’s tissues promoting healthy skin and bones. Negative ion therapy also increases the permeability to cells which allows them to absorb nutrients more easily. This helps the body’s cells and tissues rejuvenate and heal from injury and illness. Negative ions have also been shown to help decreased the symptoms of depression and anxiety. 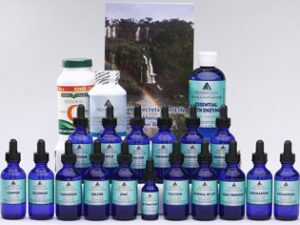 They also help to decrease the overall acidity in the body as well as to counteract the damage from electromagnetic field (EMF) radiation that comes from cell phones and computers that many of us are exposed to on a daily basis. After my 76-year old mother had broken her leg I bought this Knee mat for her to recover. Though our doctor said full recovery wasn’t possible for such an elderly person mom forgot about her injury very quickly. I use this mat for my legs to restore energy in muscles and prevent traumas as I go jogging daily and take part in marathons. It would be better if the mat was longer, or it’s just me – too tall. In my sports routine, I’m experiencing huge pressure on my knees and I was looking for something to help me restore them after the training. This knee mat has become a true revelation for me! I don’t feel any pain in my knees anymore though I’ve been using it for only 2 weeks. 32" x 20", 60" x 24", 72" x 24", 76" x 32", PRO-PLUS 74" x 28" (double the negative ions), QUEEN SIZE 80" x 60", KING SIZE 80" x 76"